The NISMO (NISsan MOtorsports) name has been around since 1984. The tuner has been heavily involved in racing over the years, and has also offered tuning parts for a variety of Nissans. Turnkey NISMO cars first started with a Skyline GT-R in Japan in the early 2000s. In 2002, the Sentra Spec V ended up with an available NISMO variant, as did the 350Z, and other vehicles. These cars had all kinds of different parts. From suspension and engine changes, to seats and spoilers, the NISMO-equipped Nissans add more spice to the driving experience. For 2013 we saw the introduction of two new NISMO vehicles: The 370Z and, of all things, the Juke crossover. The Juke has been out for a few years now but is still as polarizing as it was when it first came out. People either love the looks or detest them. You can get a souped-up turbocharged Juke NISMO in one of three versions. There’s a front-wheel drive version with a CVT; a front-drive version with a six-speed manual; and an all-wheel drive model with the CVT. (No AWD and a manual, unfortunately.) No matter which version you get, the funky looking crossover gets a direct injected 1.6-liter turbocharged four banger making 197 horsepower and 184 ft/lbs of torque—respectable numbers for a small crossover for sure—and nine more hp and seven more ft/lbs than standard Jukes. Our test model was the AWD variant, so it had the CVT. And while the engine’s numbers aren’t bad for a 2,930 lb. vehicle, it doesn’t feel that quick, mostly due to the CVT. Power delivery is odd. There’s some turbo lag coupled with the inherent slipping feel of the CVT. You expect to really feel the throttle from the turbo, but it either kicks in at unexpected times, or just never seems to deliver. Unfortunately, this engine/transmission combination generally makes the car feel slower than it probably is. Regardless, the CVT takes a lot of fun out of a powerlant that could likely be a hoot to drive with a manual transmission. Even when you switch over to Sport mode, it just never feels that quick. I’m sure the manual version is a lot more fun. Speaking of driving, the Juke NISMO, like other Juke models, features three driving modes: Normal, Eco, and Sport. Like most vehicles that swap over modes, these mostly adjust the throttle calibration. I often drove the car in Sport mode, but did sample all three. The difference is noticeable between them, with Eco being more laggy and Sporty being quicker to respond. And although the car is rated at 25 city, 27 combined, and 30 highway, I was barely able to get 20 MPG. The Juke is a thirsty little thing, and it definitely prefers highway driving to city jaunts, at least in terms of fuel consumption. Like the last Juke I reviewed, the interior is really cool, and the NISMO version adds some truly outstanding touches. 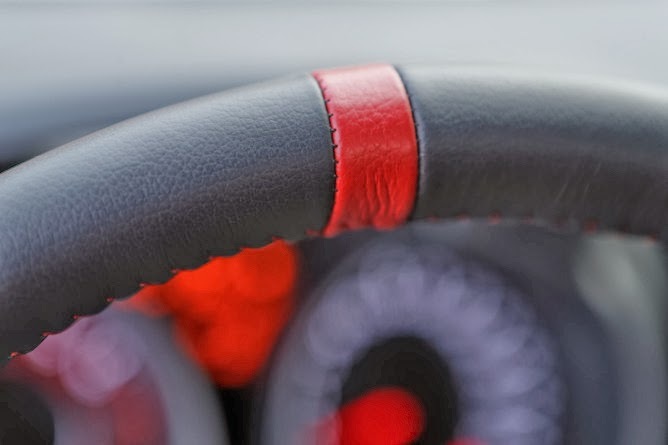 First, the steering wheel features a grippy Alcantara-clad material and a red leather “center” marker in red (much like a race car). In addition, it features some of the best seats I’ve ever sat in. They are highly bolstered in all areas, and feel like an ultra-comfortable and supportive racing seat—seriously great. Other NISMO touches include a unique shift knob and gauges. The driving position is a great mix of sporty and practical, too. You’re not too upright, but you’re not laying down, either. The sound system, touch screen, and basically all of the displays work very well and are simple to operate. Our model included the optional $1,170 navigation system, and its operation was easy to use. By the way, every car I’ve ever tested with a Rockford Fosgate stereo system has been amazing, and this one is no different. The ecoPUNCH stereo with subwoofer sounds awesome. Deep lows, crisp highs, and a decibel level that can definitely wake the neighbors; it’s awesome. 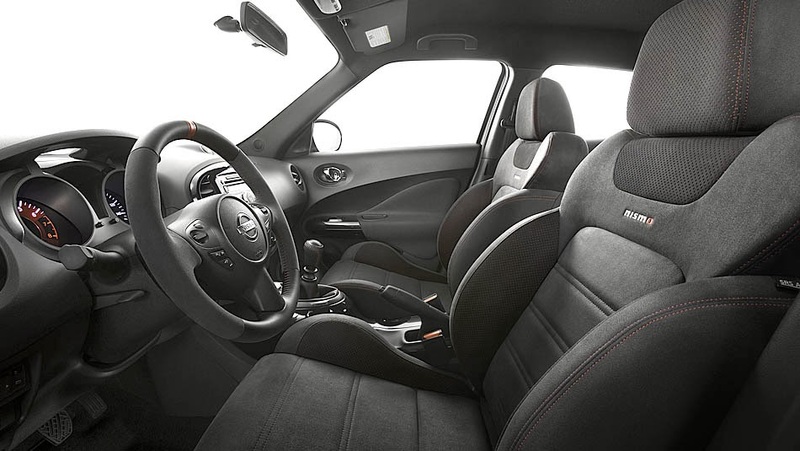 Overall, I really like the combination of practicality, comfort, and added sportiness inside. Plus, visibility isn’t bad, it’s roomy, has plenty of cargo area, and it looks futuristic and fun. 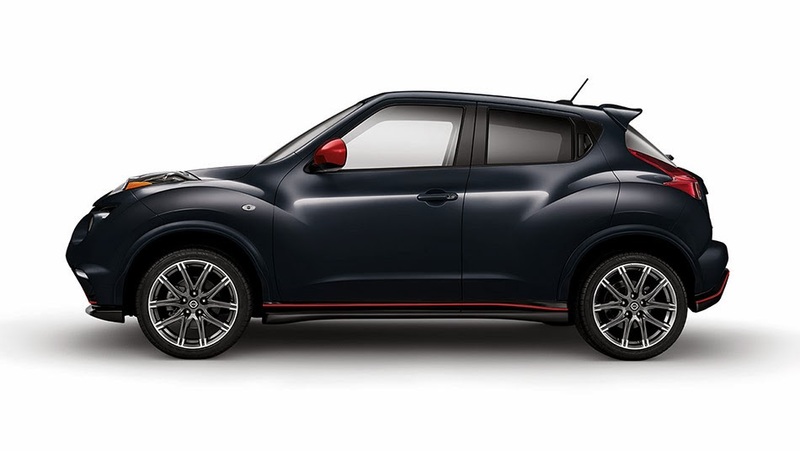 On the exterior, the Juke NISMO gets unique 18” alloy wheels and summer tires; red accent stripe and front and rear fasciae; LED accent lights up front; a different grille; and red side mirrors. Some of these look great, such as the wheels and fasciae. But the mirrors and LEDs I could live without. While the regular Juke is already a controversial mix of styling, the NISMO version looks like just has bit too much is going on for me. 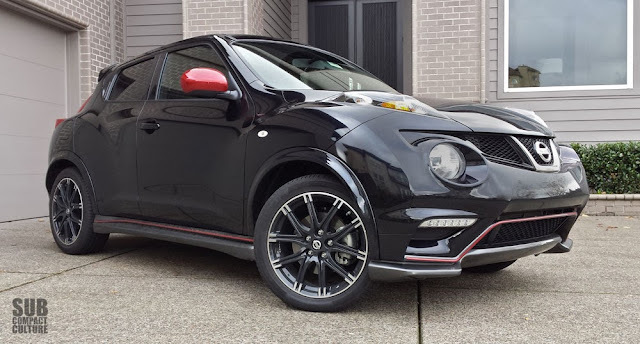 The other unique thing about this tarted-up Juke is its NISMO-tuned suspension. Handling is improved and features quick steering, little body roll, and a firm ride. Throw it into the corner and the Juke sticks to the pavement with impressive grip, thanks in part to the 18” wheels, AWD, and of course, the sport-tuned suspension. And of course, those outstanding seats hold you in place extremely well. The Juke NISMO definitely adds some neat features to an already interesting vehicle, but not everything was worth the extra cash. Our model stickered at $27,270 including destination, navigation, NISMO carpeted floor mats, and the center armrest. At that price you’re into Subaru WRX territory, which I would consider benchmark for turbo, all-wheel drive hatchbacks. The WRX has 265 horsepower and gets similar (and sometimes higher) fuel economy; at least our 2013 WRX with a manual transmission does. 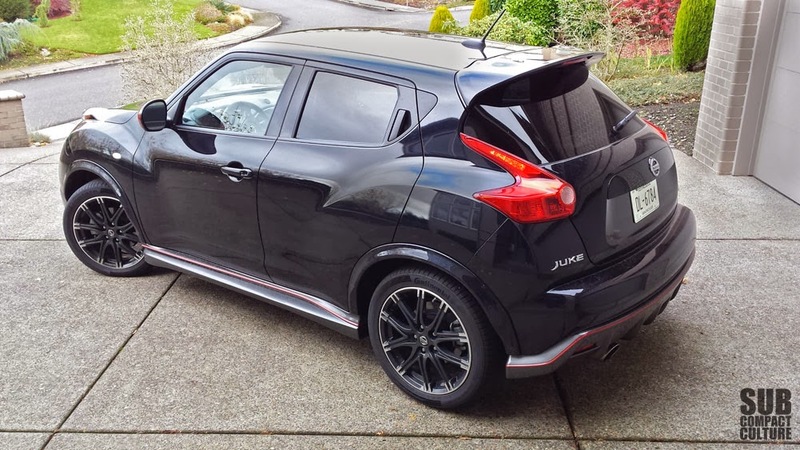 I think the Juke NISMO, as unique as it is, is a bit on the spendy side for what you get. However, do keep in mind, if you’re looking for an automatic transmission, the WRX is off the shopping list (at least until 2015). You do get fantastic seats, an excellent stereo, and a plethora of personality. I just wish you could get the AWD version with the turbo and manual. Because then you might really be able to appreciate the extra oomph from this crazy little compact crossover. The only vehicle I can think of that is uglier than a Juke is the Pontiac Aztek. I was initially not a fan of the Juke but it has grown on me. Not it's looks of course but what it offers in terms of performance.